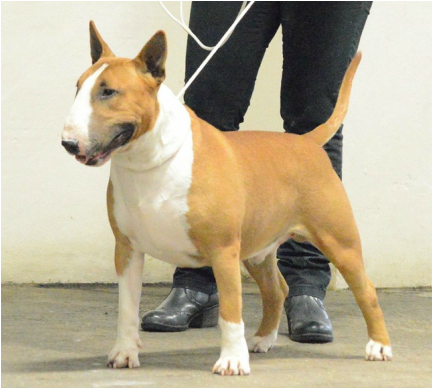 ​Today I felt the depth in males from when I last judged had improved considerably, open dog being a pleasure to assess meaning good dogs not being placed, dentition I felt had also improved on today’s evidence, however in some cases small issues were the deciding factor, movement still remains typical for the breed however my BOB was an excellent mover. I felt handling could be improved in the ring to get the best out of the dogs however presentation/condition was good. My thanks to all exhibitors for your understanding of the personal bereavement only hours before judging which resulted in a hard time trying to give of my best. Red and white, his head is strong with long neck to well set shoulders straight front, his body is shapely and deep though just needs more cover, a tremendous rear end drives him well, he has good bone and stands on good feet, generally he just need time to get the body he lacks at the moment, a promising lad. Animated white full of beans, he stands fore square owning his ground long strong head giving a classical look, his body lines were clean his front is straight under a good set of shoulders his elbows tucked under, he has a powerful well angulated rear which drives him along, I would have preferred a bit more depth and spring to his body but this does not detract from him being a good dog worthy winner. A well made white with a lot going for him, his main feature I felt was his make and shape, angulation throughout was very good, his head was filled of good size and length with fill neck was long to good shoulders and front, clean lines with a good out line, good all round dog. Powerful well made tri colour pushed really hard got so much going for him. Black brindle a great dog that I felt just needed a little more lift for balance. A youngster still and behaves like it giving her handler a hard time, her general confirmation was ok, good well packed up head with profile straight front and shapely body good rear angulation, needs time to settle and mature. Up standing red and white girl well put together through out with no exaggerations head shape was good long and filled with gentle curve, a long neck to good shoulders, a deep well sprung body powerful rear stands on good feet, she needs to tuck a little, considered for RBCC. Black and white girl whose markings do not help, I found her to be well made through out with a good head shape, her shoulders are well laid, front is straight and tucked under body lines clean, excellent rear angulation, I just would have liked her to be coupled a little tighter none the less a decent girl. A strong white girl who stands fore square make and shape was good, a strong filled up head gentle profile well laid shoulders front is true, shapely deep well sprung body, coupled well, rear angulation correct. Hardest class of the day, which made me consider the point of exaggeration. A white who’s main attribute was my definition of type/or what I wanted on the day, her head shape was good a long neck to well set shoulders her front was straight, but down a bit on pasterns splaying her feet, her body was short coupled and deep with spring though not holding her top line today rear angulation at times was under her then over stretched, I felt she would have benefited from more bone.